I had not heard about this and am very troubled that this isn’t being covered by MSM. Very troubled. From Bishop Grant LeMarquand, one of my old professors at seminary and a good guy. Received via email. 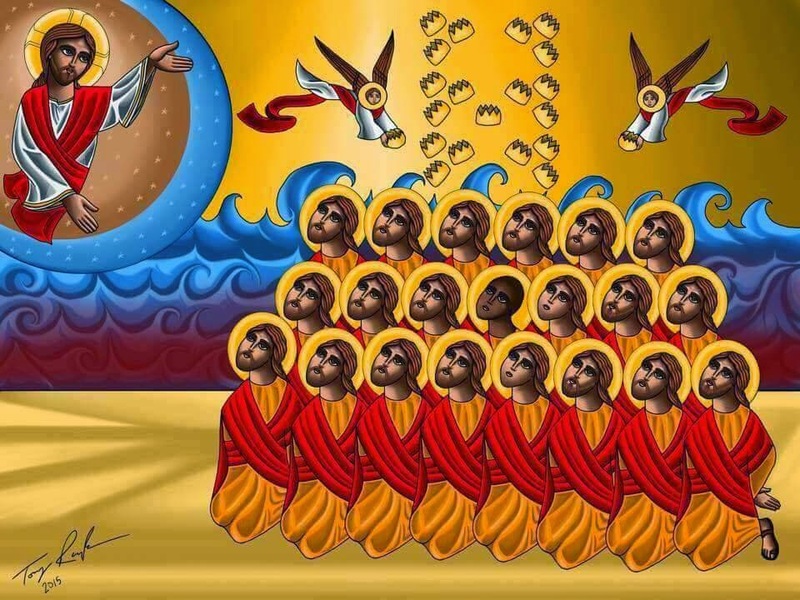 I have just learned the horrifying news that as many as twenty-eight Ethiopian Christians have been shot or beheaded in Libya by members of the terrorist group known as ISIS or ISIL. This alarming act of violence against those that ISIS calls “people of the cross” comes just two months after twenty-one other Christians – twenty Egyptians and one Ghanian, were beheaded on a Libyan beach. It is too early to learn the names of these newest martyrs. It is also too early to know what churches they came from. (The Ethiopian Orthodox Church has more than 30 million members, but there are also members of many other churches in this country, including at least 15 million Protestant Christians.) Personal details about the men who have died may emerge. For now we can note the most important things to be said about these victims. Their names are known to God and they are written in the Lamb’s book of life (Rev 13:8). Their denominational affiliation is no longer of any importance: they are among the unnumbered throng from every nation, tribe, people and language gathered before the throne and the Lamb (Rev 7:9) who have come out of the great persecution (Rev 7:14) and have had every tear wiped away from their eyes (Rev 7:17). The persecution of followers of Jesus is one of the terrible facts about today’s world. Although the popular imagination may still associate the persecution of Christians with the distant past (of the Roman Empire, for example), it is a reality that more Christians have died martyrs’ deaths in the last hundred years than in all the previous centuries of Christian history combined. We are living in a time when the words of Jesus “If they persecuted me, they will persecute you also,” (John 15:18) are being fulfilled on a more and more frequent basis. How are we Christians (those of us in Ethiopia as well as around the world) to react to this most recent atrocity? First, we must look up to God in thanksgiving for the lives of these brothers who loved not their own lives, but followed Jesus in the way of the cross. Second, we must ask for the Holy Spirit to strengthen us to abandon the temptation to hate. Instead we must follow Jesus, who not only suffered death on the cross, but also prayed for his executioners to be forgiven. If we are turned to hatred, the terrorists have won. Finally, we must continue to reach out to a world desperate for the love of Jesus. Make no mistake, the terrorists who executed these martyrs of Ethiopia have exhibited the worst of human depravity, but they have also revealed their desperate need of a Saviour. The apostle Paul, a great persecutor of the church of God, was turned to love by his experience of meeting Christ on his way to the Syrian city of Damascus. May God use his church to so act and speak of and from the love of Christ that many former or potential persecutors may be turned and have their names written in the book of life. Bishop Grant is area bishop for the Horn of Africa (Ethiopia, Somalia, Eretrea, Djibouti); under the Most Rev Dr Mouneer Anis, Bishop of Egypt with North Africa and the Horn of Africa. This entry was posted in News, The Christian Faith by Fr. Maney. Bookmark the permalink.